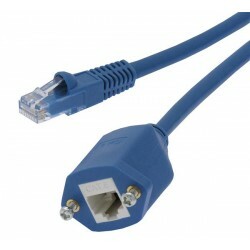 The CAT6 Panel Mount RJ45 Extension Cable is a standard network patch cable that terminates into a bulkhead panel mountable female RJ45 connector. The sturdy molded PVC panel-mount hood features embedded nuts and two screws for easy mounting on wall plates and surfaces. Ideal for extending an Ethernet network cable to the outside of an enclosure or by making a hard to reach port more accessible.